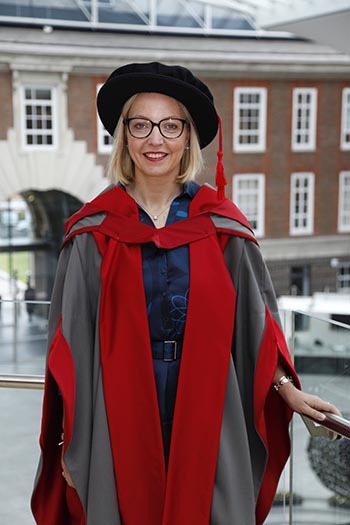 Christine Graeff, Director General Communications at the European Central Bank (ECB) and Middlesex graduate, has been awarded an honorary degree by her former university. Ms Graeff is responsible for the external and internal communications of the ECB, the digital strategy, as well as all language services in the organisation. She helped to build the 'Single Supervisory Mechanism' - the new financial supervisor for EU countries – and designed its communication governance. It contributes to the safety and soundness of the European banking system by increasing financial integration and stability. Prior to her role at the ECB, Ms Graeff worked for the Brunswick Group, setting up its Frankfurt office and leading its financial services team. Ms Graeff, who was born in Maubeuge, France, studied European Business Administration at Middlesex, and explained that she owes much of her career to her time there. "The people I met and the language skills I learnt while studying for my degree kick-started my journey," she said. "I lived with Spanish, English, French and German students - we all helped each other learn about culture and language. "I got the chance to go work in Latin America because of the Spanish I picked up at university. Business is both global and local - languages are one of the most important skills you can have." She was presented with the award at the University's graduation ceremony on Tuesday 14 July. Middlesex University Vice-Chancellor Professor Michael Driscoll said: "We are always thrilled to see graduates of Middlesex University become so well respected and influential in their specialist fields. "Christine Graeff is working right at the heart of the European financial system, and is a real inspiration to anyone wanting to pursue a career in Europe. We are delighted to present her with this award."